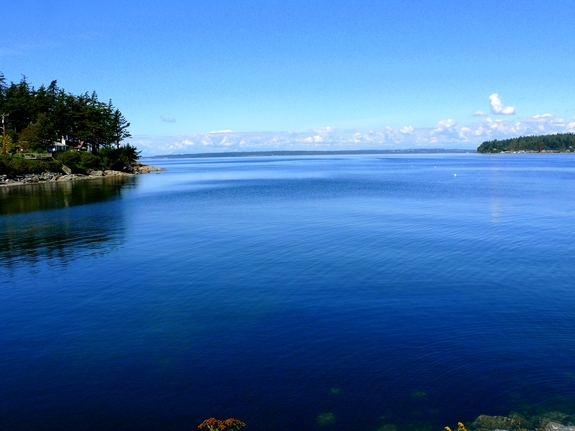 Our summer’s last hurrah took place on Lummi Island in the San Juan Islands of Washington state this past week. 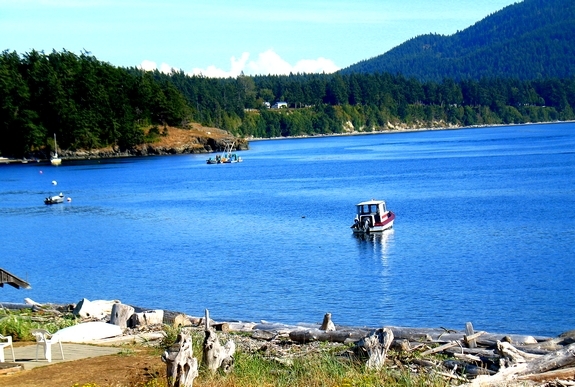 Lummi Island is the most northeasterly of the San Juan archipelago. 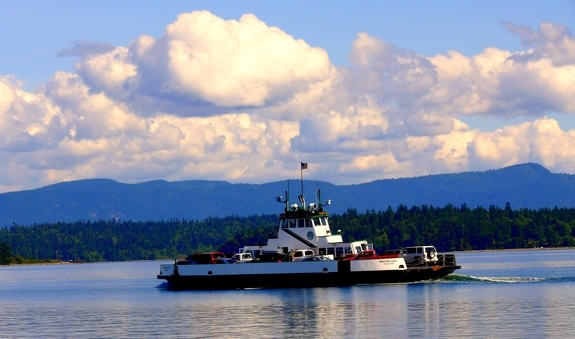 Lummi is located near Bellingham, WA and can only be reached by private boat or a small county ferry, the Whatcom Chief (pictured above). 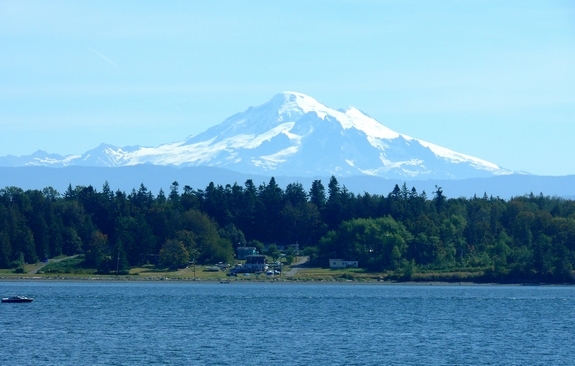 Lummi is about two hours from Seattle and 1-1/2 hours from Vancouver, BC. The island is absolutely stunning with untouched, natural beauty and a small population of residents. 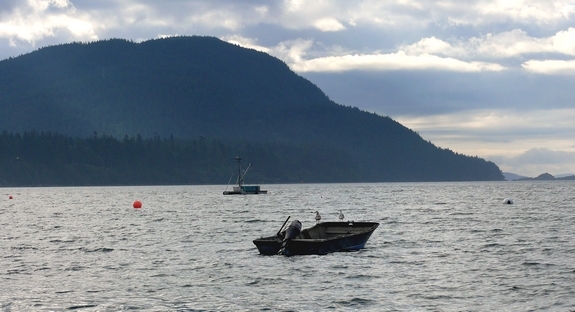 Our beach house was located in Legoe Bay, right in front of the well-known Lummi Island Reefnet Salmon fishermen, known for their sustainable practices in fishing. 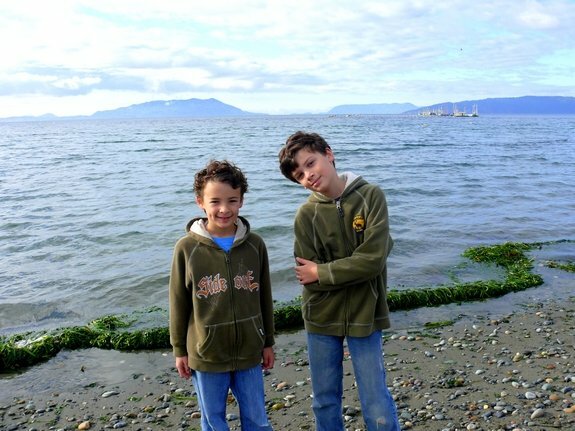 The boys had an absolute blast playing in the tidepools and beach combing for treasures. In the background you can see Orcas Island. Lots of little boats are situated in Legoe Bay as residents go out to check their crab pots daily. We had some beautiful weather days and one very stormy day. Of course on the very stormy day, a boat had been chartered for salmon fishing. Small-craft advisories, extreme high winds and water-over-the-bow type of waves kept the salmon from biting. However all was not lost, as the boat made its way through the Strait of Juan de Fuca, a large body of water that forms the principle outlet for the Georgia Strait and Puget Sound, about fifteen orca whales were spotted. They came to the boat and swam under, playing around and breaching, to the delight of the few passengers aboard. My boys say it was the highlight of their whole trip. 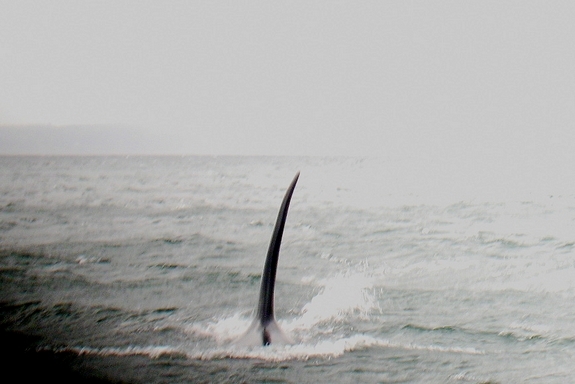 Of course the presence of the whales explains why the salmon were not biting….the whales were having lunch. 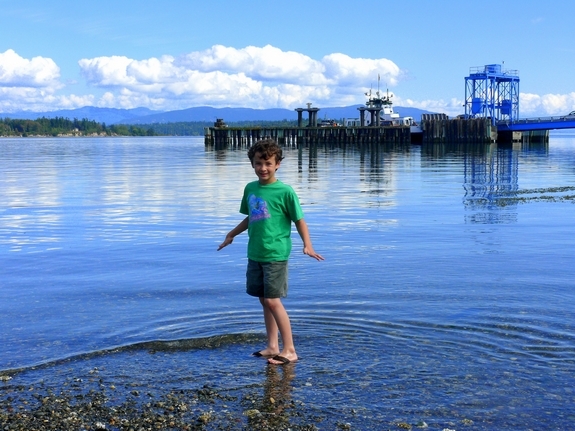 The gorgeous weather returned and we headed to the other side of the island to Bellingham Bay, another beautiful spot close to the ferry dock. You could see forever and the water was glass-like. 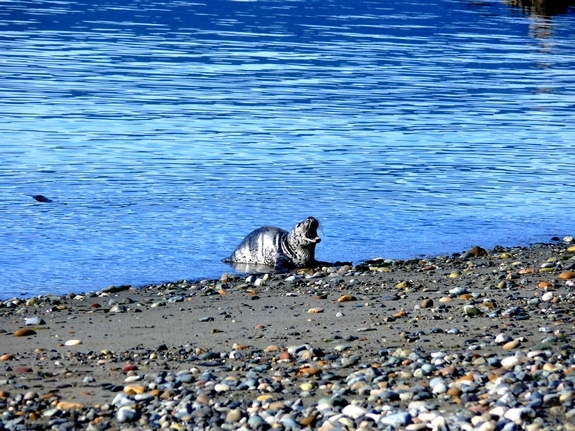 One morning this seal pup came right up on our beach,the seal wasn’t more than two feet long. With no Mom in site, we wondered what would happen to this little guy. The morning view while sipping our coffee was always breathtaking. We had a great time and really needed the time away. Now it’s time to get the kids ready for back to school and prepare the vineyard for the coming winter months. I LOVE these photos. It looks like you had a wonderful time. That baby seal and the orca would have made my day. So beautiful. And your boys are so sweet. Oh what a stunningly beautiful part of the world! How beautiful! It looks like you had a great time! The Gulf and San Juan Islands are indeed a stunngly beautiful chain.It’s fun to collect sand dollars and explore in the tidal pools. Absolutely stunning photos. You live in an area that is so unique. I bet you will be going to Seattle more frequently now that you are closer. The market there is my most favorite spot in the Northwest. Good luck with back to school and winter prep in the vinyard. What a gorgeous place to have a vacation. I visited Seattle a few times when I was still working and was always curious about the islands. Sorry I never got the chance to be on one. This reminds me of our vacations in Maine. Not the same exact scenery, but untouched, natural beauty, nevertheless. What beautiful pictures, and a great way to end the summer! Washington is one state I haven’t been to yet. Never heard of this island but it sure is pretty! Thanks for the wonderful water photos..always a fantastic thing to see. Yes it is so beautiful there, glad you had a great time. I love the San Juans. They are so breathtaking! 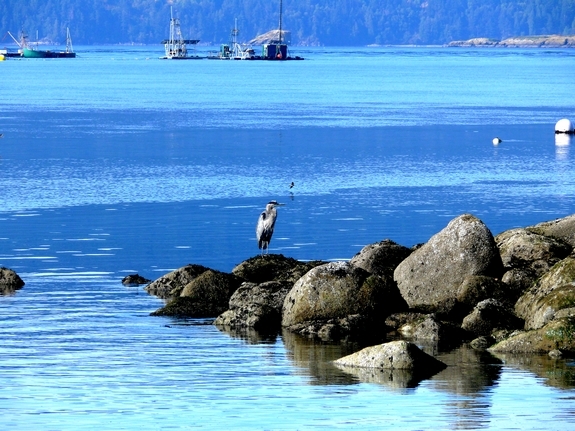 Glad you enjoyed Lummi! these are spectacular pics what a great trip! 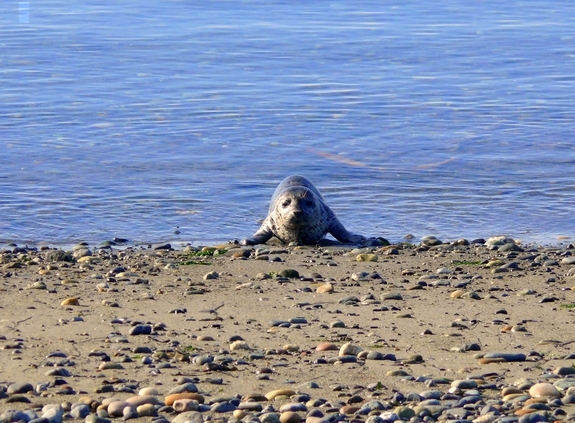 the baby seal will probably be an orca lunch unfortunately. Wow, the blue in the pictures is simply amazing! Wow, that water is so blue! Amazing photos, they really capture the beauty of the place. Glad you love your Washington State visit; we Washingtonians love our visits to Oregon as well. Glad you were able to squeeze a little vacay in before school and fall vineyard work commences! Stunning photos – so intensely blue! I’m hoping to visit the San Juans during Savor the San Juans later this month.